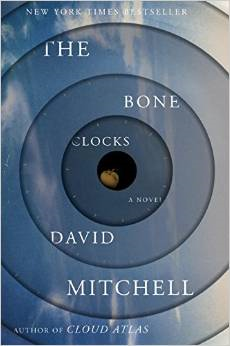 The Bone Clocks is the latest novel from David Mitchell, the author who brought the world Cloud Atlas. Set up as a series of six 100 page novella sections, The Bone Clocks follows the life of a teenage runaway named Holly Sykes from her adolescence to her old age; while at the same time following the story of an ancient secret organisation twisting the laws of nature, science, and morality in order to perpetuate the ideals and hunger for eternal youth. A foray into the realm of realistic fantasy, this latest novel by Mitchell explores the idea of conscious reincarnation and randomly chosen rebirth--what happens when a select portion of the population is born with a genetic predisposition to be able to transfer their consciousness from the body they currently occupy to either the body of a currently alive individual (temporary, and usually with the consent of the person) or an individual who has just died (permanent, and with the understanding that they will continue to live that individual’s life from that point on). While Holly Sykes, the main protagonist of the story, does not possess this capability, her little brother does. This, along with the occasional capacity for psychic premonition, draws Holly straight into the center of a long standing battle between two factions of these reincarnation travelers--one faction who wishes to protect the human race and the knowledge learned from centuries of rebirth, and one who wishes to prey upon the human race in order to further their practice of immortality. I stumbled on this book by accident--admittingly drawn in by the cover art of the book jacket, and not having previously read Cloud Atlas--and found myself engaged in a “I only meant to read a few chapters but somehow I’m reading the whole book in one sitting” situation (a situation I’ve found myself in several times before, but usually only when Harry Potter was involved). It was the first thing that I’ve read by David Mitchell, and now I want to go read all his other novels. See if it is something you want to read, or check out David Mitchell’s other novels, at the Ocean City Free Public Library.